Okay I am going to admit it…I don’t really like skinny jeans, the fashion police can arrest me but I stand by my claim! They have their place in our wardrobe, tucked into knee high boots, yes. Cropped to the ankle and worn with killer stilettos, yes. But the full length version worn with flats or heels is unflattering to me. Most of us are not 6 feet tall and stick thin so this silhouette places emphasis on our thighs which is not the look most of us are after. Enter the new “it” jean that you will be seeing and hopefully wearing this autumn. 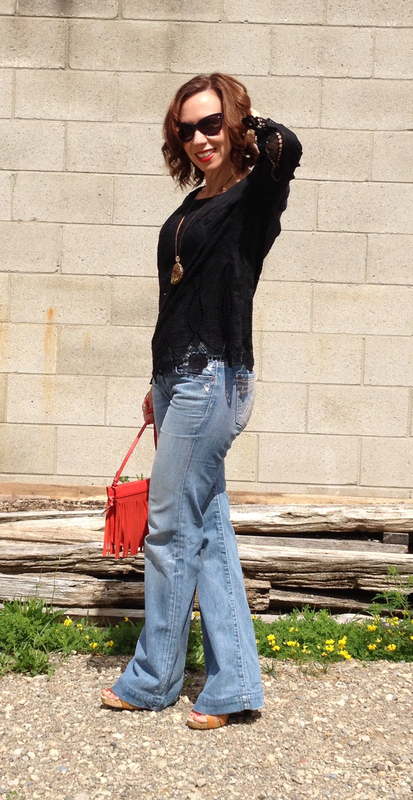 The high waisted wide leg or the flare jean will be your new bestie! They should be worn with a chunky shoe or boot and almost graze the ground to get the full leg-lengthening effect. Tuck in a printed blouse or wear them with a loose open knit sweater for a more casual vibe…the wider bottom balances your hips perfectly! These are a pair out of my archives…they are faded, worn in and I just feel funky when I wear them. My gams often feel short and I dream of having legs like Taylor Swift, but at barely 5 foot 2 that ain’t gonna happen! So I wear heels and bells. I am obsessing over lace and crochet details right now, it turns a simple cotton blouse into a statement piece. This black one will take me from summer into autumn, I will swap out the light wash for a darker version, throw on a leather jacket and some booties and be set! 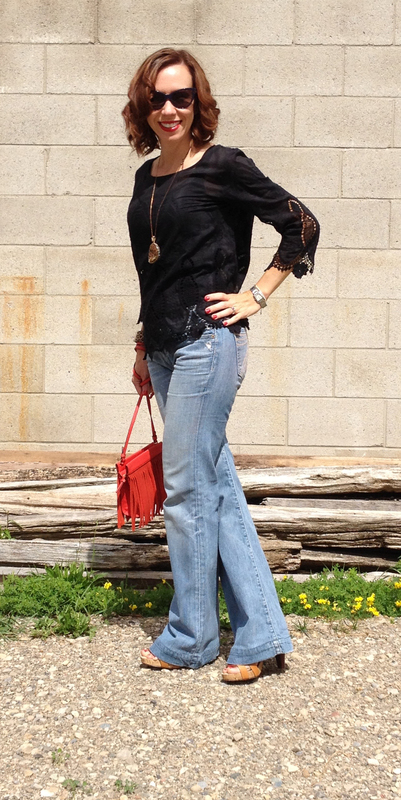 To finish my boho look, a druzy crystal pendant necklace and a red Kate Spade fringe purse…perfect! Guess shopping is now in order for some wider leg jeans! Yes it is…Can’t wait to do our fall shopping trip!